BlogHome » Blog » Don’t hesitate. 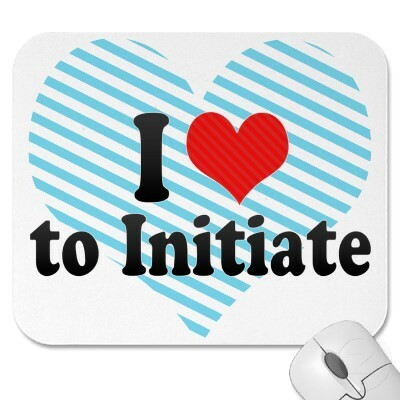 Initiate! Are there any unfulfilled desires for creative self-expression in your life? Is there any adventurous activity you’ve always wanted to try, but have continually failed to get started? There can be many reasons why we hesitate to take chances on our creative impulses, but one of the most powerful reasons of all is the assumption that there is such a thing as an ideal set of conditions for creating. Once these conditions are in place, we presuppose, we’ll have the permission and freedom to do what we really want to do. My two cents: The best pathway to the answers you need is action taken upon the answers you already have. When you act on what you do know, you attract more information and inspiration to act on. You may feel you need 3 extra hours a day to work on a goal you have, while in reality you only have 15 minutes a day that you can spend towards it. If you take an all or nothing approach and do nothing simply because “it’s not enough”, your vision never gets off the ground. But if you start where you are and “despise not the day of small beginnings”, you’ll inevitably find yourself amazed by the way in which assistance comes your way and synchronous events unfold. As a child, I grew up listening to a very prominent speaker whose audiences were always packed with people hungry to feed off of his inspirational and insightful words. I had always assumed that his crowd of followers were with him from the very beginning until I heard him tell his story. When he first “felt the calling” to speak, he used all the money from his corporate job to finance the purchase of a small, run down, gutted out liquor store in an inner city. After getting the place cleaned up, he posted a sign on the doors announcing dates & times when he’d be speaking. For the first several dozen times he showed up, absolutely no one was present. Although he considered just packing up and going home many of those times. he decided to speak to an empty audience every session. Eventually, people started to get curious about this eccentric man who talked to empty audiences and the audience gradually trickled in as they discovered great value in his thoughts. Since then, he’s never spoken to an empty audience again. The ultimate goal in life is not to gain a following or become famous. The real goal is to deliberately design a lifestyle in which you are deriving great fulfillment through loving service to the world, by using your creatives gifts in a personally satisfying way. This isn’t about being famous. It’s about having a legacy. But having a legacy, whether it involves being famous or not, requires us to abandon any strategy that demands we wait on perfect conditions. The perfect conditions are always a response to the faith we have in ourselves. Everything you need to be the person you were born to be will be there, as soon as you choose to show up first. The best part of it all? It’s much easier than it sounds. Once you get started, it only gets easier to keep going. At least that’s my two cents.